Johann Strauss I (German: Johann Strauß) born in Vienna (March 14, 1804 – September 25, 1849), was an Austrian Romantic composer known particularly for his waltzes, a form of music he was instrumental in popularizing. Beginning his career in the string quartet of Joseph Lanner, Strauss went on to form his own orchestra, specializing in light, danceable music including waltzes, quadrilles, polkas, and marches. Against his will, Strauss' son, Johann Strauss II, also pursued a career as a waltz conductor and composer, leading to a bitter rivalry between them. The younger Strauss went on to eclipse his father in terms compositions of lasting popularity. Two of the elder Strauss' other sons also went on the successful careers in music. Strauss' waltzes were especially lilting in their 3/4 or 3/8 time and this light music revealed the new romanticism in music with an expressive tonal color and sparkling harmonies. His most famous piece, however, is the Radetzky March (named after Joseph Radetzky von Radetz), while his most famous waltz is probably the Lorelei Rhine Klänge op. 154. Strauss' parents were innkeepers, and his father was a Hungarian Jew who converted to Catholicism. (During the Nazi era Strauss' Jewish origin was falsified by the authorities using forged documents, making him into "Aryan.") The location of his father's inn at the Danube Channel and the neighboring harbor with its rafts and boats from different countries and the music played by the sailors, influenced Johann's enthusiasm for popular dance music. Tragedy struck his family as Johann’s mother died when he was seven of “creeping fever.” When he was 12, his father, who had since remarried, was discovered drowned in the Danube River. His step-mother placed him as an apprentice to a bookbinder. 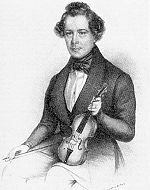 During this time, he took lessons in the violin and viola in addition to fulfilling his apprenticeship, which he successfully completed in 1822. He also studied music with Johann Polischansky, eventually securing a place in a local orchestra, which he eventually left in order to join a popular string quartet formed by his later competitor Josef Lanner and the Drahanek brothers, Karl and Johann. Known as the Lanner Quartet, this ensemble played mostly Viennese waltzes and rustic German dances, later expanding into a small string orchestra in 1824. Lanner was one of the earliest Viennese composers to reform the waltz from a simple peasant dance to something that even the highest society could enjoy, and his music became increasingly popular. Strauss eventually became conductor of the orchestra in which he played for Lanner and was soon made director of a second smaller ensemble which was formed as a result of the success of the parent orchestra. In 1825, after he realized that he could emulate the success of Lanner and thus put an end to his financial struggles, he decided to form his own band and began to write music for it to play. The resultant competition between himself and Lanner did not entail hostile consequences. In fact, their musical rivalry was very productive for the development of the waltz as well as other dance music in Vienna. Strauss soon became one of the best-known and well loved dance composers in Vienna, and he toured with his band to Germany, the Netherlands, Belgium, England, and Scotland. 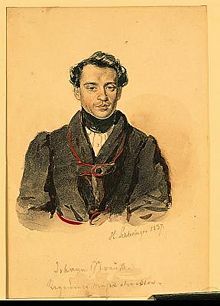 On a trip to France, in 1837, he heard the music associated with the dance form known as the quadrille—a precursor of the square dance—and began to compose quadrilles himself, becoming largely responsible for introducing that dance to Austria at the 1840 Fasching (Lenten carnival), where it became very popular. It trip established the foundation for Strauss' success with audiences from various national and social backgrounds and thus paved the way to his forming an ambitious plan to perform his music in England for the coronation of Queen Victoria in 1838. Strauss married Maria Anna Streim in 1825 in the parish church of Liechtenthal in Vienna. They were the parents of Johann Jr., Josef, Eduard, Anna, and Therese as well as another son, Ferdinand, who was born 1834 and lived only ten months. Strauss as a strict disciplinarian and imposed his will on his sons to pursue non-musical careers, intending that his children not confront the challenges that a struggling musician may face. The marriage was relatively unstable, as Strauss' prolonged absence from his family due to frequent tours abroad led to a gradual alienation. The marital tension was exacerbated when he took on a mistress, Emilie Trambusch, in 1834, with whom he would have eight children. After Johann's open declaration of his paternity of a daughter borne to Emilie, Maria Anna sued for divorce in 1844 and allowed Johann junior to actively pursue a musical career. The divorce from Maria Anna probably marked Johann Strauss II's first development as a composer. Despite his family problems, Strauss toured the British Isles frequently and was always prepared to write novelty pieces for the many charitable organizations there. His waltzes were developed from the peasant dance in three-quarter time. Strauss typically opened his pieces with a short introduction with little or no reference to the main structure which consisted of a chain of five two-part waltz sections with a short coda and a stirring finish. Strauss' waltzes were especially lilting, with an expressive tonal color and sparkling harmonies. 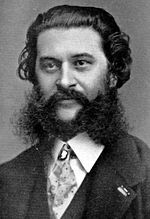 While Strauss' rivalry with Lanner was relatively benign, he took a more disapproving view toward the blossoming work of his son, Johann Strauss II. The younger Strauss, on the other hand, often played his father's works and openly declared his admiration of them. However, it was no secret to the Viennese that their rivalry, fueled by press reports of bitter antagonism, was intense. Strauss I added to the controversy when he famously refused to play ever again at the Dommayer's Casino after this venue offered his son his conducting debut. Father and son also found each other on opposite political sides, with Strauss I composing his famous Radetzky March in honor of the imperial general and Strauss and the younger writing music with revolutionary themes. Strauss I would tower over his son during his lifetime in terms of career advancement, although Strauss II was to eclipse his father in terms of popularity in the classical repertoire. In 1846, Johann Strauss I was conferred the honorary title of KK Hofballmusikdirektor (Director of Music for the Royal Court Balls) by Emperor Ferdinand I. By this time, the growing popularity of the waltz genre in high society was not only a European phenomenon. During the middle to late nineteenth century, the waltz became increasingly popular in the United States, and waltzes were often found on the programs of American orchestras. While Johann Strauss I did not possess a musical talent as rich as his eldest son's, he was one of the pioneers of the waltz as a serious musical form. And although his business sense was also not as acute as his son’s he was among the first few composers to write pieces with individual titles to enable music enthusiasts to easily recognize those pieces with the view to boost sales of their sheet music. In addition, during his performances at the Sperl-Ballroom in Vienna where he established his name, he pursued the concept of collecting a fixed entrance fee from the patrons of the ballroom instead of the previous practice of passing around a collection plate where income is only guaranteed by the goodwill of the patrons. The music of Johann Strauss I is featured prominently on the annual New Year’s Eve concert presented by the Vienna Philharmonic Orchestra. The Radezky March remains a particular favorite of Viennese audiences. Hanslick, Eduard, and Henry Pleasants. Music Criticisms, 1846-99. Baltimore: Penguin Books, 1963. OCLC 765055. Levine, Lawrence W. Highbrow/Lowbrow, The Emergence of Cultural Hierarchy in America. First Harvard University Press, 1988. ISBN 0-674-39077-6. Pastene, Jerome. Three-Quarter Time: The Life and Music of the Strauss Family of Vienna. New York: Abelard Press, 1951. OCLC 1542388. Strauss, Johann, and Nikolaus Harnoncourt. Johann Strauss in Berlin. Hamburg: Teldec, 1999. OCLC 42882439. History of "Johann Strauss I"
This page was last modified on 11 May 2018, at 16:36.